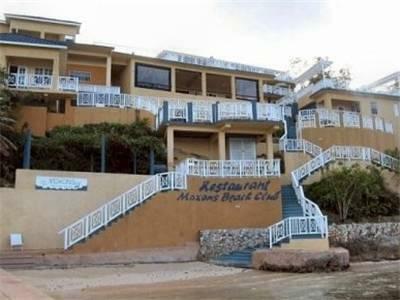 ﻿ Best Price on Moxons Beach Club in RioNuoya + Reviews! Built on a hill, this 4-tiered, oceanfront property features a private beach along the Caribbean Ocean. This Jamaica hotel also offers international dining, an outdoor pool and rooms with private balconies. Ocean views can be seen from every air-conditioned room. The seating area includes cable TV and each accommodations at Moxons is individually decorated in tropical décor with wood or tile floors. There are local Cook shops within walking distance for take out or pick up by property staff or guest. Guests have free access to the gym and sundeck. The concierge staff can arrange numerous excursions. A gift shop and convenience store are on site as well. Ocho Rios is 8 miles from this boutique hotel. Dunn's River Falls and Dolphin Cove are 15 minutes’ drive away. Upon check-in photo identification and credit card is required. All special requests are subject to availability upon check-in. Special requests cannot be guaranteed and may incur additional charges. Office is open from 9:00am to 9:00pm. Reservations made after 9pm will not be confirmed until the following day between 9:00am and 9:00pm.